The internet is constantly buzzing with the latest and greatest updates from companies and buyers alike. This makes gathering robust marketing intelligence a bit challenging. How are you supposed to stay on top of everything happening in your industry when new information can be released at any moment? 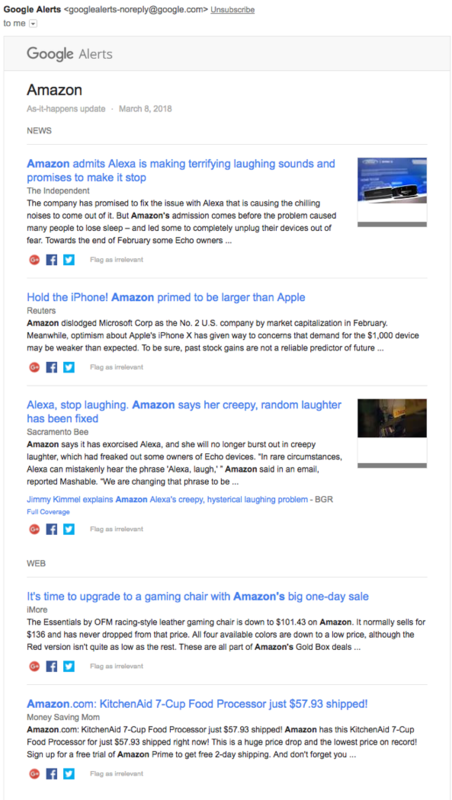 One simple way to keep track is by taking advantage of Google Alerts. With Google Alerts, you can set up email alerts based on specific search terms and preferences, allowing you to get important updates about each of your competitors. Here’s how you use Google Alerts to track your competition. We’ve all been there - we don’t know the answer to something, so what do we do? Google it. The beauty of using Google Alerts is that rather than having to ask Google a question, you just tell Google what you want to know and when you want to know it. It’s quick and painless to set up your alerts. 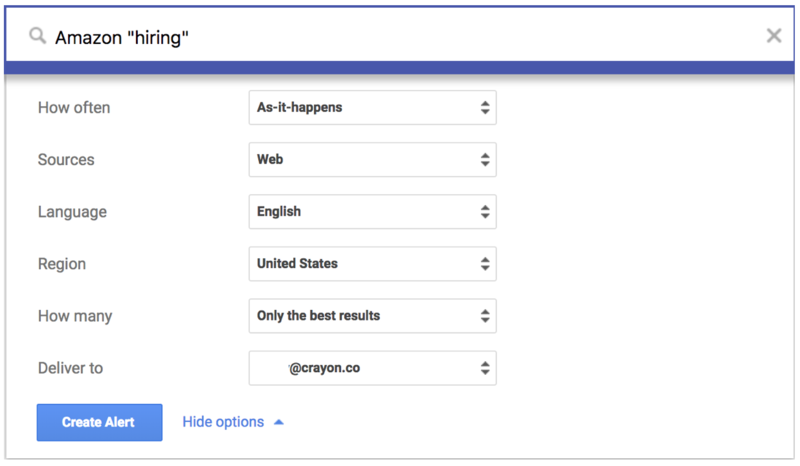 There are basic ways to set up your alerts such as just using a competitor's name, or you can get complex with your search terms for more refined results. If you want to start with the basics such as company name, set up an alert for each competitor. Then, you can tailor your alerts with keywords, sources, and frequency choices. Here are some tips to make your alerts more unique by adding in keywords, sources, and frequency preferences. Google searches will return a lot of results. You can use different combinations of terms to refine your search results. 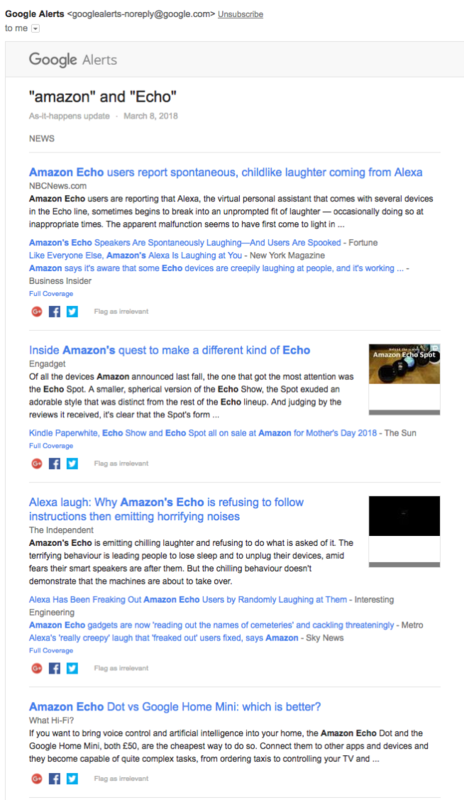 To make sure you search for an exact match, use quotations around the words, similar to when we refined our first Amazon search to include only Echo results. You can also use words such as AND and OR to get different results. If you set up an alert that says “Amazon” AND “Google,” you will only receive results that include both companies. This can be helpful in catching mentions of two competitors working together. However, if you choose “Amazon” OR “Google,” your results will return with one or the other - helpful for creating some catchall alerts for updates from multiple competitors at once. It’s important to be as specific as possible when setting up alerts so that you don’t waste time with irrelevant results. When you set up your Google Alerts, you can set multiple parameters such as frequency, quality of the results, and medium of the results. This is helpful because you can get alerts once a week, once per day, or you can have them sent instantly to your inbox the moment your search term(s) appear on Google. When you set up an alert, you’re also given the option of where you want the information to be sourced from such as news, blogs, video, etc. Specifying the source is helpful to cut down on noise in search results and uncover unique content. For certain information such as reviews, you may want to include sources such as blogs, discussions, or videos, but for company updates, you may only want web-based results. Focusing on certain content types can help you hone in on updates you might overlook otherwise - such as competitor product videos posted to YouTube or customer discussion threads comparing products. The options for tracking your competitors with Google Alerts are endless. To get more relevant information, beyond just the name of your competitor and news about their top product, get more specific with your search terms. You can set up individual alerts for each competitor with keywords such as ‘hiring’ or ‘product update’. For example, you can learn a lot about your competition’s strategy if you keep an eye on hiring patterns. If you want to know when your competitors are hiring in the United States, set up an alert such as Amazon “hiring”. To get the best results, you’ll want to refine your alert to only get web activity, which will give you results straight from Amazon as well as wherever they have job postings. Decluttering the medium will exclude results such as videos and blogs from coming up within your results. This is an alert you may want to see immediately, so set the How Often option to As-It-Happens, and the How Many option to Only the best results, and the Region to the United States. This will send you the best and most relevant results about open opportunities at Amazon, the moment they are listed online. Another useful alert to monitor is product updates from your competitors. Tracking updates from your competition is highly beneficial for your internal product team. 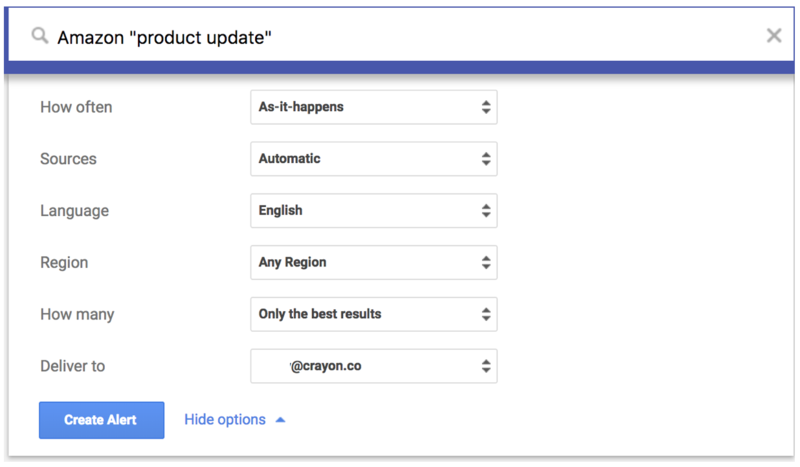 Use keywords such as ‘product update’ or ‘announcement’ in your alert search. You can then set up your alert rules for source, frequency, and type of results. Here, you would want the results immediately, only the best results, and you could either leave the sources as automatic, which will source the results from multiple mediums, or specify it to web results. Since you’re likely setting up many alerts, rather than getting a bunch of emails, you can create a digest. All of your alerts will be in one email so that you don’t have to sift through multiple emails. 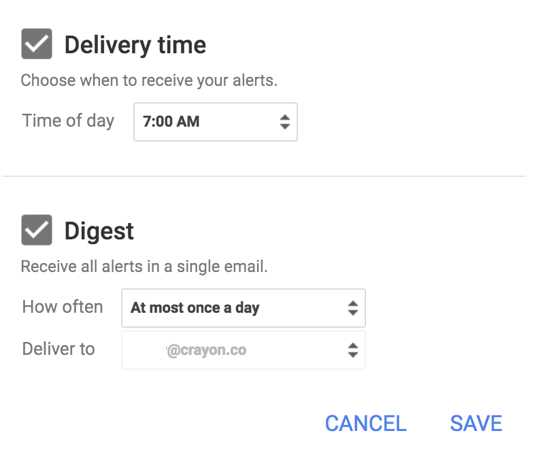 If you decide to only get your alert once a day or once per week, choose a time that works best for you - such as over your morning coffee - and get your alert digest at your convenience. Having all of the latest information on your competitors’ moves at your fingertips is critical to stay ahead in an active market. For example, if you’re releasing a new product featuring new technology, and you receive an alert that your top competitor is planning to release something similar in the coming months, you can use that to your advantage. If possible, your product team could expedite the release date so that you’re leading the charge. Knowing what’s happening in your industry, not just inside your company, can help your company advance and move one step ahead of your competition. Google Alerts are valuable for getting fresh information straight to your inbox. But, if you want to learn how to get even more information, on a deeper level, request a free demo of Crayon Intel Pro.